If angels could sing then they would undoubtedly gather under the rafters of Mogens Dahl Concert Hall. Situated close to the waterfront in central Copenhagen, Mogens Dahl Concert Hall has been building an impressive reputation, not only for its professional chamber choir, but also the aesthetic presence of the venue. 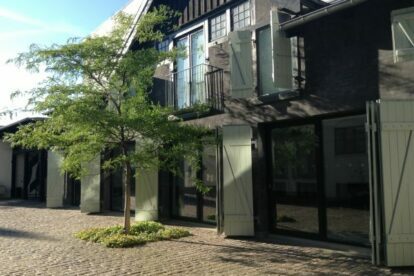 Elegantly restored in 2005 by the architects Frank Maali and Gemma Lalanda, the former stables now comprise 3 concert halls that resonate wonderfully with its neighbor, Vipp’s head office, with the courtyard providing a perfect scene for outdoor events. The sensitive acoustic design was performed by the acoustic specialist, Jan Voetmann. The founder and driving force behind this project is the former choirmaster of the Danish National Opera, Mogens Dahl, who has been pioneering Scandinavian choral music and bringing it to an international audience. Mogens Dahl has also intelligently evolved the concert halls possibilities by inviting personalities from the Danish cultural, political and business community by combining lectures with communal singing. I have enjoyed this unique concept for the last 3 years bringing myself a little closer to the personalities that share their ideas spiced with Denmark’s rich song tradition. Thanks to Mogens Dahl, Copenhagen has been enriched with a valuable asset.